Tracks 1-24, 28-29 September 11, 1946, at Studio and Artists Recorders, Hollywood, California. Tracks 25-27 October 17, 1946, at Los Angeles, California. In 1982 in the U.S. the first 23 tracks of this CD were issued, initially on LP in a gatefold vinyl album on the Giants of Jazz label, GOJ-1025, and subsequently on CD with the same catalogue number. The following year, 1983, in the U.K. the same LP album and CD appeared. (The personnel given on these issues differs slightly from that given on this Upbeat CD reissue.) The CD was reissued again later on the Jazz Crusade label, and it is that particular disc that appears on this Upbeat issue. (Upbeat a short time ago acquired the Jazz Crusade label.) All of that is a little confusing, perhaps, and to compound the difficulties, in his review of the Jazz Crusade CD, Marcel Joly gives a different personnel listing which he avers is definitive but which is not clearly delineated. Based on all of these sources, my listing above is what I hope is accurate. To complicate matters even further, in his biography of George Lewis— George Lewis: A Jazzman from New Orleans—Tom Bethell indicates in an appendix that the Kid Howard’s Brass Band, of which Lewis was a member, was filmed playing two mock funeral numbers for this movie, these being Flee as a Bird (Algiers, La, Aug. 31, 1946) and, as Howard remembered it, St Louis Blues (Algiers, La, Sept. 1, 1946). These were filmed over the two days, and Bethell avers there must have been numerous takes. All, it seems, ended up on the cutting room floor; and Bethell says although transcriptions were made, none had surfaced as of the time of his Lewis biography’s appearance (1977), nor has any to date. No mention of Howard’s Brass Band is made in the movie’s or the afore-mentioned CDs’ credits, although Bethell provides the band’s personnel as well as its performance and location dates (as does Joly). The opening sequence on this disc has the basic Armstrong group augmented by some unnamed studio musicians. Of course, the music is what matters finally. 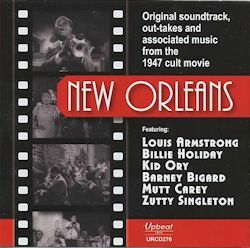 As a search of the reviews of the movie New Orleans shows, it is generally conceded that the film was, for jazz lovers at least, a flop, a huge let-down after the promise it offered when its premise was to tell the story of the advent of jazz. (The movie is still available on various places such as eBay and Amazon—at some outrageous prices, I may add. It is also, at the time of writing, available for viewing on youtube.) Only the music got two thumbs up. Another jewel is the first take of Dippermouth Blues which is taken at a very leisurely tempo and contains no stop time or cry of “Oh, play that thing!” thus contravening the expectation. The second take is more conventional with stop time and exhortation included. Yet another surprise is the opening of King Porter Stomp which begins with a drum intro accompanied by a trumpet fanfare. In all of the numbers featuring him, Armstrong meets expectations, especially his signature super high notes, as, for example, the upper stratosphere he reaches in the coda of Basin Street Blues . This is, after all, a fairly young Louis—he was only in his forties at the time. Also, his voice is not as “gravelly” as it was to become later. Like Armstrong, the other star vocalist, Billie Holiday, was young, barely into her thirties. But her talent was by this time well developed; her signature phrasing is evident here, and the emotion she could pack into a lyric—a certain sadness, even hopelessness, on occasion—is to be found in both Do You Know What It Means to Miss New Orleans and Farewell to Storyville. The memorable, if melodramatic, scene containing the latter where she leads the assembled crowd in singing the dirge as they depart Storyville, and particularly when they sing one chorus a capella, is perhaps the best in the whole movie and one which lingers in memory. And Armstrong’s obbligatos behind her singing are masterful. This disc from Upbeat makes available once again the classic music from what should have been (but is not) a classic film. The bonus is that it also provides most of the music that didn’t make it onto the screen, in addition to several tracks laid down for commercial release, including those where Minor Hall substitutes for Zutty Singleton. Perhaps the next iteration will contain the lost transcription of the Kid Howard Brass Band performance.